Also published as Ingenious Travel Game and using the same system as the bestselling Ingenious 1-4 player game, this brilliant strategy game has been an international bestseller in 14 countries. 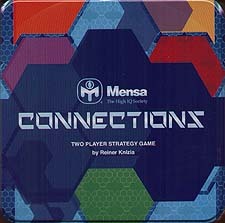 Since it was first launched in 2005 under the MENSA name it has carved out a place in the hall of fame of abstract games and has won many prizes. It is one of those rare games that is played over and over, year in and year out. The object of the game is to score lines of colours leading out from the symbols on the tiles you place. The winner of the game is the player who has the highest score in his weakest colour. Hence the necessity to make sure that you advance all of your colours, not just a few. It is fundamentally a simple game, but to be a top player requires a great deal of strategy! The author of the game, Reiner Knizia, is the world's leading games designer with hundreds of successful board games to his credit. But he admits to this game being one of his finest achievements.